This 25a stainless steel toggle switch is spring loaded On. So you push to switch on and it springs back when you let go. This ever popular retro look stainless steel 15a toggle switch is great in a wheelhouse or cuddy but is not fully waterproof. These are our most popular rocker switch. These 15amp lit switches are happy in your wheelhouse or in a exposed position. 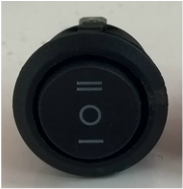 12 volt 16 Amp LED lit rocker switches. These are by far our most popular switch. When you turn on your device the switch is lit by a back light within the switch. They provide a bright visual warning either in light or dark conditions. They are fitted to your panel with all local wiring leaving you to connect your chosen device to the center pole of the switch. The label of your choice will be added as directed by you. Choice of four colours and colour can be mixed on the panel as you choose. ​£ 9.00 with splash proof cover. 12 - 24 volt 5 Amp push button latching ON - OFF switch. 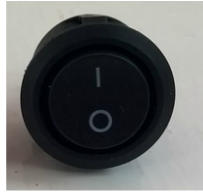 The push button switch is a very popular choice for low energy consumption devices. They can also be used to switch high usage devices by employing a relay. The switch is not lit. Choice of four colours and colours can be mixed on your panel. The label of your choice will be added as directed by you. They are fitted to your panel with all local wiring. Heavy duty 12 - 24 volt 5 Amp push button latching switch. This is the heavy duty version of the switch to the left. It is almost twice the size of the normal switch though the same capacity. Black only. The label of your choice will be added as directed by you. They are fitted to your panel with all local wiring. These are a very popular switch. When you turn on your device the switch is lit by light within the switch. They provide a bright visual warning in light dark conditions. They are fitted to your panel with all local wiring leaving you to connect your chosen device to the center pole of the switch. The label of your choice will be added as directed by you. Choice of four colours and colour can be mixed on the panel as you choose. 12 - 24 volt 10 Amp ON/OFF/ON rocker switch. Nav lamps and the Anchor light will never be lit at the same time. ​Bilge pump on and Bilge pump Auto modes will never be selected at the same time. They are fitted to your panel with all local wiring leaving you to connect your chosen devices to the outer poles of the switch. Two labels of your choice will be added as directed by you. ​£ 11.00 with splash proof cover. This switch is the same in all respects to the switches to the left however it has a higher rating. Blue dot only is available at this time. ​£ 10.00 with splash proof cover. 12 - 24 volt 10 Amp ON/OFF rocker switch. This is the single action version of the 10 Amp switch to the left. They are fitted to your panel with all local wiring leaving you to connect your chosen device to the unused pole of the switch. The label of your choice will be added as directed by you.